(CNN) -- Let's just say it. The whole thing sounds insane. 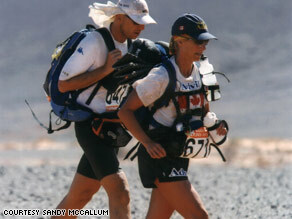 Despite blisters and 130-degree heat, Canadian Sandy McCallum pulls ahead on a grueling day in the desert. For six days, people from across the world -- accountants, school teachers, farmers, CEOs -- will run 150 miles, the equivalent of five consecutive marathons, across one of southern Africa's most remote landscapes. Without showers, toilets or beds, the racers must fend for themselves by carrying in their backpacks all the food they will need for the week. Water is rationed, despite 120-degree heat. And the racers will wear whistles to summon help should they encounter a wild animal that seems inclined to make them into dinner. "Nothing has ever made more sense to me," said Jim Molaschi, a 46-year-old South Florida engineer, who escapes from his cubicle as often as possible to do adventure races that make "Survivor" contestants look like pageant queens. Molaschi is among the 214 racers who will, beginning May 17, traverse Namibia. It's the latest footrace staged by Racing the Planet Limited, which has hosted 18 similarly styled races, known as the "4 Deserts," since the mid 1990s. The first three courses -- each about 150 miles -- run across Chile's Atacama Desert, where it hasn't rained in 200 years; China's Gobi Desert, where the first dinosaur eggs were discovered; and North Africa's Sahara Desert, where camels have been known to eat Racing the Planet's pink flag race markers. Only those who complete the first three are allowed to participate in a walk across Antarctica known as the Last Desert. Racing the Planet is the first group to stage an endurance event across Namibia. Mary Gadams, Racing the Planet's director, was stunned this year as more people registered than ever before. "It's the worst economy in years, and the world seems like it's falling apart, yet there is this real thirst out there to do this," she said. "Maybe when everything that you defined yourself by in the 'normal' world isn't so stable, some people want to rediscover who they are outside of 'normal.' They want an incredible experience." Racing the Planet competitors include a Mount Kilimanjaro summiteer from Germany, a British insurance broker, a Spanish government official, a Canadian physician and an American architect. There are Ironman competitors in the mix with a few people who have never run more than 13 miles. The oldest woman in the race is a 68-year-old grandmother from Australia, Jennifer Murray, who set a record in 1997 by becoming the first woman to circumnavigate the earth in a helicopter. Most racers compete for charity, and over the years they have collectively raised about $500,000, said Gadams. In 2008 Racing the Planet teamed with Operation Smile to provide 97 villagers in Egypt with free reconstructive surgery, she said. Physicians and trained volunteers ride in all-terrain vehicles along the route, distributing water and medical aid. No one has been seriously hurt during past races. Helicopters -- including one provided by the Namibian government -- are at the ready. Competitors, as in any endurance event, sign off on the risks. Letting go of their vanity is something most racers learn after a couple of hours on the course. "When you've got a CEO of a major company copping a squat in the desert, you are seeing them in a way their board members would never dream of," said Sandy McCallum, a 47-year-old former reporter turned record-setting fulltime runner who won Sahara among women in 2007. Pain also begets camaraderie. At the end of each stage, racers are given hot water for the dehydated food they have carried in their packs and sleep six to a tent. "You can imagine how that makes people let go of their vanity and their personal space real quick," said McCallum. Friendships form quickly; romances are not uncommon. McCallum met Molaschi during the Gobi race and the two are reuniting with other Gobi competitors in Namibia. Rory O'Connor, an Irish Army vet and father of five, is also meeting Racing the Planet friends in South Africa. Namibia is the fourth desert ultra for O'Connor, a South Carolina personal trainer who was inspired to do his first race, Gobi, in 2006, after catching a National Geographic special on the event. "I was watching that and I immediately said out loud, 'I could do that,' " he said. O'Connor sent a reporter a photo from the Atacama race of his ankle so blistered and bloody that CNN isn't showing it. The 41-year-old underwent surgery for a hernia two months ago, but that hasn't deterred him from wanting to run Namibia. He put his backpack soon after the operation and started training again. "People have said, 'Oh you shouldn't do that, you'll hurt yourself.' But I don't want to live my life like that, afraid of something that could happen, that might go wrong. I could hurt myself anywhere." "After [these races], everything else in my life seemed like such a smaller hassle," O'Connor said. "They humble me. When you come back to your real life, nothing is going to seem like too much for you to handle."